Fermentation on the paleo plus diet is a huge part of the "plus" that follows paleo in its name. Of course you can buy this stuff at the Whole Foods and pay WAYYYY too much money for rotten food, or you can rot it your damn self. All it takes is about a week in a dark corner of the house. First off it does take a week or more, so be prepared to make at least a weeks worth at a shot, and keep making it because once you run out it will be harder to get it rolling again. Why? Well, because we are busy, that's why. And it is a bit of work, its not hard, but it does make a mess and we have to be prepared to make it, AND clean it up. This wouldn't be so daunting if I had a garbage disposal, but I don't. 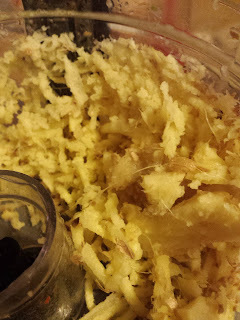 I have a food processor, I mentioned in my first post that you would benefit form having one of these, you can read that post here. I like to shred when I ferment and my food processor is the best thing I can think of to do that, I would like to invest in a lid with a larger shoot to shove my food into but at this point I am fine cutting my stuff smaller and with carrots and ginger I really don't have an issue fitting them into the standard shoot. This recipe was brought to my attention by my friend "Bread Hurts My Head" who sent me this from Fermented Food Lab and it is amazing!!! As you all know I am not one for measuring too closely and in this recipe I didn't change that, when it comes to fermenting I am really relaxed. Everyone I talk to tells me "you got to be careful", or "be sure it is all submerged", I say poppycock. I have been winging it for over a year and I have never had an issue. I have a very healthy gut, as far as I can tell, and I am as regular as I can imagine people get. Having said that I am not endorsing winging your fermentation, I mean you need to be comfortable with what you do. I am comfortable with my way of doing things and you will have to find a way for you to find the same. I began by shredding my ginger which, again, I did not measure, I just eyeballed it. It was eyeballed to be more than the 6 tsp which is what the recipe was asking for, I like a little heat. And, mind you, I knew the container I was going to use and after fermenting for a while I got a feel for how much of things I aught to be adding. I took most of a 5lb bag of carrots, trimmed them and shredded them adding them to my Fido container mixing in a bit of salt and ginger while macerating it all with my hand. 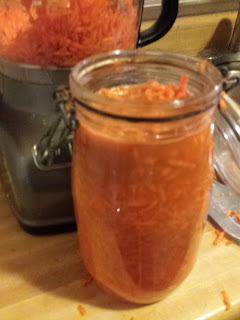 Not so surprisingly the carrots sweat and filled the container with liquid so I didn't have to add water at all, I usually add water to my sauerkraut but maybe not any longer after this experience. Once the container was full I capped it and put it in my cabinet where I would burb it, or open it slightly every day just to let pressure out . Fido now has a lit you can add an airlock to and I would recommend this if I had tried it yet, but I haven't, but when I do I am willing to bet it works great. 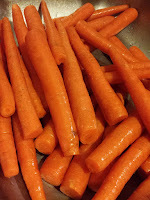 Now my carrots were often found not submerged in liquid and I again had no problems with this, I even offered some to a friend so I was fairly confident with it but that doesn't mean you have to be, by all means be vigilante we are talking about bacteria and that is nothing to be messing around with.